A statewide point dataset containing the approximate location of oil or hazardous material release or disposal sites where an Activity and Use Limitation (AUL) has been filed. Releases of oil and/or hazardous material to the environment are required to be reported to the Massachusetts Department of Environmental Protection’s (MassDEP) Bureau of Waste Site Cleanup (BWSC), in accordance with M.G.L. Chapter 21E and procedures established within the Massachusetts Contingency Plan (MCP) (310 CMR 40.0000). The sites mapped in this datalayer represent only a subset of the total reported release sites tracked by MassDEP Bureau of Waste Site Cleanup (BWSC). An AUL provides notice of the presence of oil and/or hazardous material contamination remaining at the location after a cleanup has been conducted pursuant to Chapter 21E and the MCP. The AUL is a legal document that identifies activities and uses of the property that may and may not occur, as well as the property owner’s obligation and maintenance conditions that must be followed to ensure the safe use of the property. The complete AUL is filed at the County Registry of Deeds office for the respective City/Town. In addition, a copy of the AUL is available in MassDEP BWSC site files and in City/Town Offices where the AUL is located. Location types featured in this datalayer include the approximate center of an AUL site, the center of a building on the property where the release occurred, the approximate center of the lot, and source of contamination. Under Massachusetts’ privatized waste site cleanup program, data maintained by MassDEP regarding site location is provided by Responsible Parties (RP), Potentially Responsible Parties (PRPs) and by Licensed site Professionals (LSPs), who work for the RPs and PRPs. Anyone wishing to view an AUL site file can make arrangements with the respective MassDEP Regional Office through a Freedom of Information Act (FOIA) request. The MassDEP encourages persons to review these site files when they make decisions that consider a specific site. The point layer is stored and distributed as AUL_PT. Many of the locations in this datalayer are based on information provided by the RP, PRP or their LSP. Locations in this datalayer should ONLY be considered as an ”approximation” or “best estimate” based on the information available at the time the site was mapped. The accuracy and completeness of the information submitted has not been verified by MassDEP. AUL site data are temporal. Although the datalayer will be updated on a periodic basis, it will never be complete or up-to-date. Please refer to the associated Unlocated Sites List (AUL_PT_USL) for a current list of unmapped AUL sites. Users should make arrangements to review the BWSC site files (at the appropriate MassDEP Regional Office) for the most current information. The MassDEP recognizes that point features are not the ideal spatial model for representing contaminated areas, especially in the case of large sites or if considerable contaminant migration has occurred. However, due to legal and accuracy considerations, the spatial representation of AUL sites as point features is currently the only realistic method for generating AUL site data on a statewide scale. Point locations representing AUL sites in this datalayer have not been field-verified and should be considered approximate. Locations were derived through review and interpretation of paper maps and textual information contained in Mass DEP BWSC site files, which are maintained in the respective MassDEP’s Regional Offices. Please be advised that this datalayer is incomplete. The MassDEP has been unable to locate some AUL sites due to inadequate source material. AUL Sites that are not yet reported are not mapped. AUL site contamination may extend well away from the point representing a site on this map. The MassDEP BWSC site files should be reviewed for the most accurate and up-to-date information about a particular site. While the AUL site data shown on this map provides some useful information, the user should be aware of the data’s limitations. For further information, please consult the datalayer description documentation of DEP Oil and/or Hazardous Material Sites with Activity and Use Limitation sites on the MassGIS Web Site at: https://docs.digital.mass.gov/dataset/massgis-data-massdep-oil-andor-hazardous-material-sites-activity-and-use-limitations-aul. Questions regarding the AUL site data on this map may be referred to the MassDEP GIS Program at (617) 574-6856. The MassDEP BWSC is responsible for providing the MassDEP GIS Program with a comprehensive listing of AUL sites. A development layer was created from this data using geocoded address information. AUL sites were located using MassDEP files and AUL notifications filed at Massachusetts Registries of Deeds. Both sources contain a variety of types and qualities of maps, including surveys, site plans and locus maps. MassDEP GIS Program staff reviewed this file information and identified the best manuscript maps and supplemental text information for locating sites. The attribute section of this document contains a listing of the types of source manuscripts utilized for this datalayer. On-screen digitizing using the PDT and the best available manuscript map information was the primary method of automation. In situations where manuscript maps and other source information from the file record were inadequate or unavailable, MassDEP technical staff were asked to help locate the site based on knowledge gained in the course of their professional activities involving that AUL site. Using address match data in the development layer, the PDT navigates data developers to the general vicinity of a site. The PDT then displays the best digital base imagery available for that vicinity. The PDT uses MassGIS 1 meter (1:5,000) color digital orthophoto images (DOQ) as the default basemap. After interpreting the source manuscripts, the PDT is used to generate a point on the base image that best represents the site location, then record information about the type of source material, type of feature located, and an assessment of the horizontal accuracy of the mapped feature. The Release Tracking Number (RTN), is a unique 7-digit site identifier assigned to reportable releases by MassDEP BWSC. This number is preceded by either 1,2,3 or 4 (e.g. 3-0001234) according to the MassDEP region in which the site is located (see: description of MassDEP Region ID below). RAO Release Action Outcome, a site/release where an RAO Statement was submitted. An RAO Statement asserts that response actions were sufficient to achieve a level of no significant risk or at least ensure that all substantial hazards were eliminated. TIER2 Any Tier Classified disposal site that is not Tier ID pursuant to 310 CMR 40.0502 or 40.0520(5) and does not meet the Tier I Criteria described at 310 CMR 40.0520(2). Class A RAO: Remedial work was completed and a level of "no significant risk" has been achieved. A-1: A permanent solution has been achieved. Contamination has been reduced to background or a threat of release has been eliminated. A-2: A permanent solution has been achieved. Contamination has not been reduced to background. A-3: A permanent solution has been achieved. Contamination has not been reduced to background and an Activity and use Limitation (AUL) has been implemented. A-4: A permanent solution has been achieved. Contamination has not been reduced to background and an Activity and use Limitation (AUL) has been implemented. Contamination is located at a depth of 15 feet but evaluation has determined that it is not feasible to reduce it. Class B RAO: Site assessment indicates that "no significant risk" exists. No remedial work was necessary. B-1: Remedial actions have not been conducted because a level of No Significant Risk exists. B-2: Remedial actions have not been conducted because a level of No Significant Risk exists, but that level is contingent upon one or more Activity and use Limitations (AULs) that have been implemented. B-3: Remedial actions have not been conducted because a level of No Significant Risk exists, but that level is contingent upon one or more Activity and use Limitations (AULs) that have been implemented, and contamination is located at a depth of 15 feet but evaluation has determined that it is not feasible to reduce it. Class C RAO: A temporary cleanup. Although the site does not present a "substantial hazard", it has not reached a level of no significant risk. The site must be evaluated every five years to determine whether a Class A or Class B RAO is possible. All sites are expected eventually to receive a Class A or B RAO. Note: AULs are legal restrictions used in the context of the Massachusetts Contingency Plan to limit future exposure to contaminants remaining at a site See Guidance on Implementing Activity and Use Limitations for additional information. MassDEP BWSC Downloadable Sites List - This compressed file (RELEASE.ZIP) includes a database file (RELEASE.DBF) containing a record for all reportable releases tracked by the MassDEP BWSC. MassDEP BWSC updates this file on a regular schedule. Tablular data contained in RELEASE.ZIP can be related to the AUL_PT datalayer by the RTN. 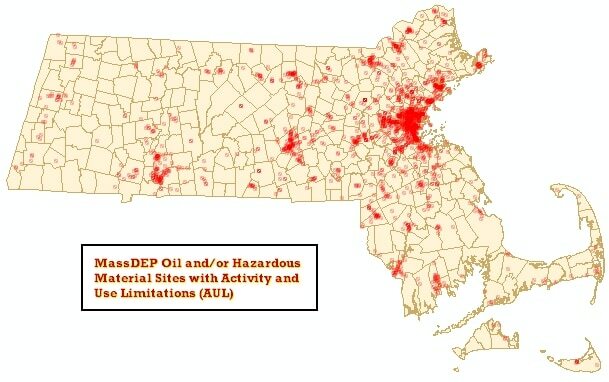 Please note that Oil and/or Hazardous Material Sites with AULs are only a subset of the total reportable releases contained in the MassDEP BWSC Downloadable Sites List. Registry of Deeds (AUL_PT_ROD) – Contains Registry of Deed Book/Page information compiled by MassDEP BWSC to date. Please note that this data is currently a work in progress and is an incomplete, partial list. Future update of this information will be dependent on staffing resources. Location Documentation Table (AUL_PT_LDT) - See MassDEP Standards for Point GIS Data. Unlocated Sites Table (AUL_PT_USL) - Contains a list of known, unlocated Oil and Hazardous Materials Sites with AULs at the time of publication. In the 1/12/2016 update this table is empty, as all current AUL sites have been located. The MassDEP GIS Program maintains this datalayer in cooperation with MassDEP BWSC. The current data are up-to-date through January 10, 2019. On June 5, 2014 revisions to the Massachusetts Contingency Plan (MCP) were promulgated. In accordance with the amended MCP all formerly classified Tier1A, Tier1B and Tier1C sites were reclassified as Tier I. These changes are reflected in the release published by MassGIS on 9/24/2014. Also see the MassDEP Tier Classified Oil and/or Hazardous Material Sites (MGL c. 21E) Datalayer, which often is updated in conjunction with the AUL sites. If you have questions regarding this datalayer, please contact the MassDEP GIS Program at (617) 574-6802 or (617) 574-6856. Shapefile and .dbf tables, ArcGIS 9 LYR. Updated 4/11/2019.